Feed your Ruger LCP, Glock 42, or Kel-Tec P3AT inexpensively with these remanufactured rounds from Military Ballistic Industries (MBI). This cartridge profile propels a 95-grain copper-plated projectile with a round nose that is intended for smooth, seamless feeding. The bullets are made by Berry's and are rated to withstand speeds up to 1,150 feet-per-second without risk of shedding which could cause excess fouling. The projectile is crimped into a once-fired brass casing that has been carefully inspected for safe tolerances before being cleaned. Other components utilized include clean-igniting Boxer primers from CCI or Winchester alongside propellant from Hodgdon. 95 grains is common to the .380 ACP caliber and matches a wide range of practice and defense loads. That means shooters can expect similar performance and point-of-impact between this ammo and their carry choices. Hade some failure to fire - but then my Diamondback is a bit sensitive!. Anyway, well worth the money for range ammo. Sorry they are all gone and I didn't get more. I will not buy again. In less than 50 rounds I had 3 jams in my very reliable PK380. Ammo is also very dirty. However, the Lucky Gunner service was very good with very fast shipping. I will order from them again, just not this product. Put all 100 rounds through my new LCP, rapid fire , all rounds fired flawlessly (good ammo, great pistol) somewhat dirty but I clean my weapons constantly so no big deal. Will purchase more when they become available. Great buy for the range. I have ordered these two other times before. I did find one with a poorly seated primer and some of the bullets are slightly scratched but still safe to shoot. Again, great for the range and plinking but I suggest something else for carry. Great price good value. Brass in good condition for reloads. Used in my P3AT. I bought 100 rounds to compare prices to store prices. Cheaper than gun store, about the same as Wal-mart but they never have .380 in stock. I got my order 3 days after I placed it, placed on Monday afternoon and it was at my door when I got home on Thursday. I had no mis-fires in 100 rounds, it was a little dirty but I clean after each trip to the range. I would recommend to anyone who has a 2-3 days till their next range trip. Good clean ammo. Fast delivery. Good stuff. Need to stock up. Shoots well. and seems no more dirty than most in my Colt Goverment Model Good price, great service, goes 'bang' when required. (smile) In fact, I just ordered more! Wanted something to test out a new weapon, this worked well in my LCP, no misfeeds or misfires. these and dirty birds work great together. Ammo shoots well for a reload. Average pricing. Quick Delivery. Great price and product. All feed well thru my 380s. Excellent ammo and reasonably priced. I have put 75 or so rounds through my Bersa Thunder with no mis-fires. This is an excellent product at an attractive price. With 75 rounds through my Bersa Thunder and no mis-fires, and the great service of Lucky Gunner, you can bet I will be purchasing more very soon. I don't have a lot of time to go from store to store to find the best price. Convenience means value to me. I have tried many ammo types in the Ruger LCP and for the price this ammo really delivers. I have and will order more soon. Worked well for the first rounds thru a Ruger LCP. No misfiresor misfeeds. Great service, fast shipping and excellent product. Will be ordering more! Quality is outstanding with excellent performance. Purchased 200 rds for practice width my Bersa Thunder. Very, very fast shipment;l and amoshot well. I would recommend to any one for practice. VERY PLEASED PERFORMANCE, VALUE, AND QUALITY ARE GREAT. 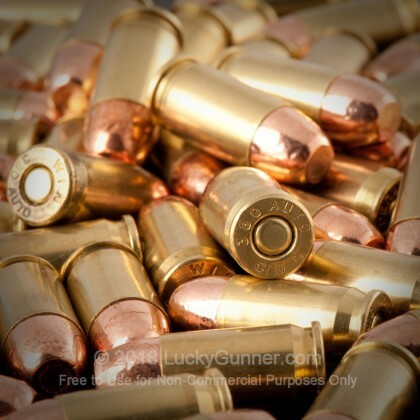 This ammo worked fine in my Sig p238 and I got it very quickly from LuckyGunner. Good ammo at a good price. Very fast shipping. Will buy from Lucky Gunner again. excellent bang for the buck! keep em comin! Used ammo at the range to break in my Bersa 380. Had no problems. Also purchased .38 rounds as well. Highly recommend both. Great price and value. Not a single misfire out of my Bersa Carry Conceal. Friend shot a couple mags through her Ruger LCP and no problems there either. Most are gone out of that 100 and will be ordering again soon. Have put 100 rounds through a Walther PPK-S with no problems. Fast shipping. Accurate billing. Overall, a very satisfying experience with both the ammo and with Lucky Gunner. Got my ammo on the expected day of arrival! 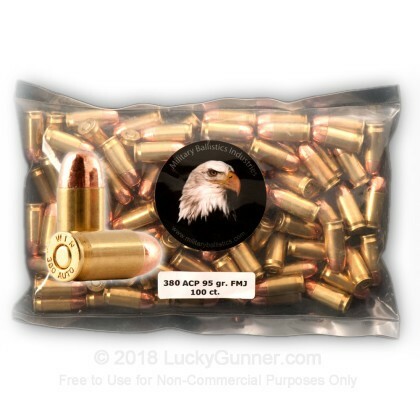 Its hard to find DECENTLY priced .380 ACP ammo in my area! Now I gotta make some time for the range! A very good deal by today's standards. bought this ammunition to shoot in a Makarov (380 barrel). so far not a single misfire or misfeed. i recommend them. i will buy again. 100 rounds and 30 mins of fun. 380s have been over priced every were I go, but this was the best deal in the market. Got the ammo for my Bersa Thunder twice now quickly, and they always seem to have it in stock. out of 200 rounds I had one mis-feed, but the was probable due to the pistol not being oiled properly. I bought these so my wife could get some practice with her Thunder .380. Good value, no squibs, shoots accurately. bought this ammunition to shoot in a Walther PP .380....will be glad to let you know how it shot after I try it, but judging from past experience (.45 ACP) I imagine it will shoot just fine. Put 100 rds through my Bersa 380, had one round not feed properly. Very satisified, will order again. Bought a bag and have run about 1/2 through my Bersa .380 Thunder. I've had 2 misfeeds but that could be due to other things. I recommend them. I will buy again. bought a few bags for target practice. i am very pleased with my purchase & have bought more since. the only reason i gave it a 4 on value is the current price of 380 ammo compared to other calibers. Everything was great except for a squib round here and there. Fast shipping was a plus as well! Just ran about 15 rounds through a Taurus TCP380 with no problems at all.Only rated 4 on quality due to roughness of bullet casting, but will order more for practice ammo. If the rest of this bag does as well, I'll be very pleased with this ammo.